Spring, time to start seeds. The containers are plastic cups with four holes around the bottom periphery to drain. 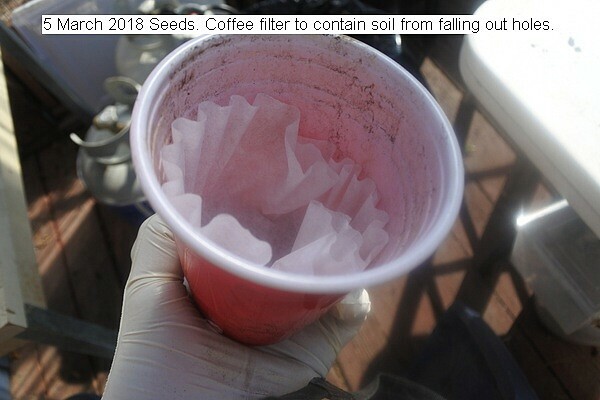 A coffee filter placed inside to prevent soil from running out the drain holes. Soil was prepared and screened during the summer. The pots are placed in a container to facilitate bottom watering. Seeds are germinated on a wet paper towel. After germination they are placed in the pots. Economic and simple. This entry was posted in Uncategorized and tagged 5 March 2018 Seed Starting, Seed Starting, Seedlings. Bookmark the permalink.